We had been hoping that our trepidation concerning Miss still being for sale was unfounded, and that we had secured him with the chipping and passport vet visit. To be sure that all was in order, we asked the agency to send us all the paperwork they had received. 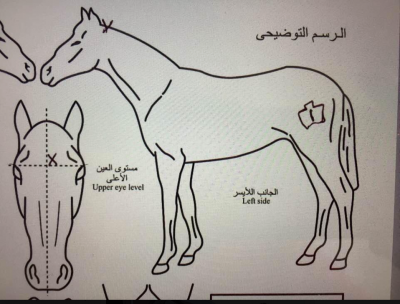 We saw this identification drawing. Not only did Miss appear to have a new brand, he also appeared to have lost the PL 8 one by which we had initially identified him. We were horrified, and after a lot of questions being asked, it transpired that the dealer had presented the wrong horse to the vet. We couldn’t believe it, although the lack of chip now made sense. Now we have a dilemma. It’s very expensive doing all this paperwork, and buying and transporting even one horse to safety, and we’ve wasted money on chipping a random horse. 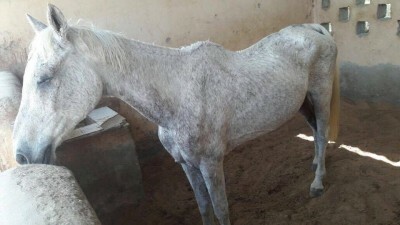 Then, we see a photo of this second horse and he is in a desperate state, and we all decide that we can’t leave him there. We just can’t. It seems like a twist of fate this has happened for him, so we make the decision to try to get him out as well. He is so very thin. We have called him The Wrong Horse (TWH). We know nothing about him, other than he has somehow wriggled his way into our mission. 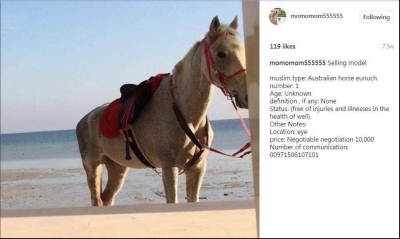 He’s lucky, because during the course of looking at these pages of horses, we have seen a lot of once quality horses discarded like old bikes. We’re even more concerned about him than Miss. Even if he lasts the weeks before transport is arranged, will he be strong enough to handle the vaccinations, what will he be fed, if anything, and most importantly, will the vet issue him with a health certificate to travel? 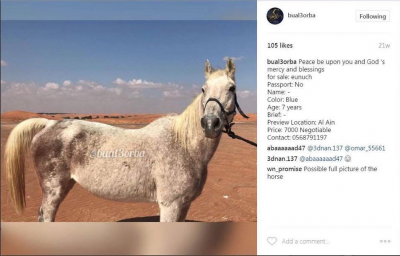 With a horse so poor, the correct procedure would be to nourish and care for him before travel, but being so far away, we have no control over any of that. The initial transport plan was to move the horses, with saline drips at the ready, in a trailer. 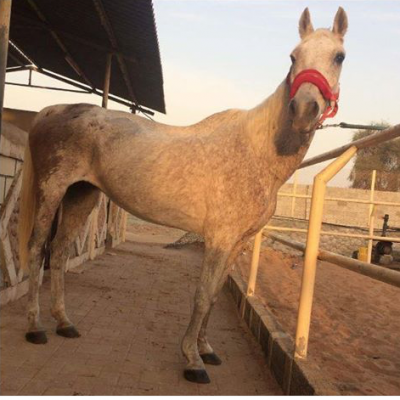 We accepted that he wouldn’t be passed fit to travel in a trailer, hence we made the decision to spend on a truck with aircon, and luckily we did, as that was all that convinced the vet to issue the Health Certificate. 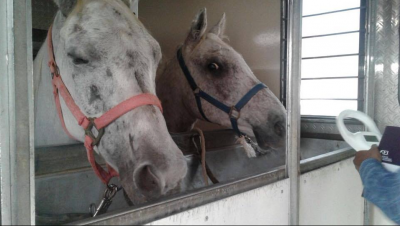 If he hadn’t been permitted to travel, we would have taken the decision to euthanase, and spare him one of the unspeakable fates that await these unwanted horses in yards in Group VII. We suspect he’d probably have starved to death. Now we have his safety assured, we really would like to trace his origins. We know nothing about the brand, there have been suggestions he originated from South America, from Spain, but we don’t have a definite idea. 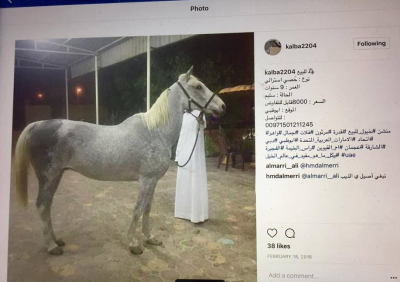 The dealer informed us he found him wandering with a Bedouin tribe, but there are previous photos of him for sale, in better condition, so his information cannot be trusted. We hope that the blood mark over his quarters is so distinctive that he might jog someone’s memory. Surely, aligned with the brand, he will be identifiable? The screenshots below show him over a period of time advertised for sale. This photo below of him in the truck warms everyone’s heart. He’s the boy in the background with the freckles, and he is so relishing being in the comfort of a truck, with hay to eat. Doesn’t it looks like he knows he’s dodged a bullet?